I was born in 1916 in a well-to-do and decent family as an only child: my mother's side being Christian and my father's side being Confucian. In her dream of the coming child, my mother saw a sun rising from the East and moon rising from the West, dashing toward each other to meet on the zenith of the sky to become one in what seemed to be a heavenly marriage. Both of my physical parents entertained a secret expectation of my becoming a great person in the future. But in their limited conservative thoughts, they asked the question: "How can a girl become a great person except by marrying a great man?" Without a single exception I said: "I will marry God." They were deeply worried and very sad because according to a Korean saying, if a girl should denote some connection with a celestial thing in talking about herself, it would mean short life because going to heaven means premature death. I was a happy girl, leading a life without many ups and downs until my junior high school days, when there were student uprisings against the Japanese regime. I was a shy, introverted girl, but to the utter surprise of my family, I initiated an independence movement with the help of some senior girls. We printed handbills in a secret place, led demonstrations shouting "Monsei" for the independence of Korea against the Japanese regime, and marched through the many streets of my native town, which is now near Panmunjom. Then I was put in jail for a few weeks. I chose Christian schools for my high school and college education because those schools taught Korean language and literature while in the government-run schools, Japanese was taught and spoken. I was so serious about the fate of my fatherland. I was a diligent churchgoer in my high school days, doing it out of obligation. But in my college days I wanted to probe into the deeper truth and mystery of life. But it was in vain because there was no one to give me the answer to my questions. Upon graduation, I received an award citing my high academic accomplishments, high moral virtue, and deep faith in God. I was so conscience stricken and so deadly serious that I was almost ready to reject the award. But being shy and introverted, I feared that I might arouse attention. So in cowardice I could not do that. After receiving the award, for the first time in my life, I was so serious as to continue to pray and pray in a remote room all by myself for three months. But I ended up not finding God. How I wanted to have God as my personal God directing me all through my future! But I felt my prayers were unanswered. Now I understand that my prayers were answered in a most wonderful way. Ever since my graduation I worked at Ehwa Women's University where I had graduated from, as instructor and then assistant professor and, after studying abroad, as associate professor. I was exposed to our Church as Dean of Students at the College of Liberal Arts and Sciences. At that time, many brilliant students from the campus would go to a very strange group of Christians. The rumor was spreading; the school was very watchful. Dr. Young Oon Kim was sent from her department and I from mine to save the girls from "falling prey to that hated group." Dr. Kim, a graduate from three theological seminaries, gave strong debate. A theological battle was fought; after a certain time she yielded and accepted. At that time she had an unknown sickness which no doctor could define. When she would come to the Church, the sickness would be gone. But when she doubted, it came back with acute pain, as if it were a warning signal against her negativity. Fourteen people joined the movement. All fourteen received the gifts of speaking in tongues or prophecy. We went through great tribulation. The school branded us as heretics. It gave us the alternative: if you want to belong to the Church, then you must leave school. The Korean Constitution grants religious freedom. At the school there were daughters of sorcerers and daughters of atheists, but we were branded as heretics. So we left school. And when we did it, we felt as though we were being decorated by Heaven. I can so vividly recollect all that took place in those days. As you can well imagine, negative parents filed a court case. We were under government investigation; the established churches called us heretics out of sheer jealousy and the Education Ministry branded us as a dangerous religious cult. And Father was sought for arrest. In our tribulation, we could see that God was working with us. So many miracles happened in those days. In prayers, members would prophesy, so we would know beforehand what was coming. When Father was in jail, a man in a Silla dynasty costume would appear to us, knocking at the door. We asked what he was there for. He answered: "I was instructed by Heaven to go down and find a certain church which was under persecution." Never having read the newspapers, he had a hard time finding such a church. A small child told him: "Unification Church." H testified to Father before us. I was a collected, reasonable woman. I never believed in anything until it came to me as my own personal experience. Having attended missionary schools, I took the sermons as words of discipline and moral teaching because I had no personal experience with God. And I never had meaningful dreams. But after joining the movement I had dream after dream. If I didn't understand it, it would come in succession until I did. Because of persecution in my home, I could not pray openly. On one occasion I gazed at the ceiling, concentrating my mind in prayer to God. I had my eyes closed. A great sensation came over me. I saw sparks from my body and felt very light. I opened my eyes, but I was still there. I closed my eyes and all of a sudden I landed in an unknown land with beautiful rocks and purple flowers. I shouted: "Where am I?" A voice said: "This is the new world." Looking at the place where the voice was heard, I found Father. He was all by himself. There was a huge tree. When I asked, he said that it was 6,000 years old. It was a leafy tree with rich branches. The roots exposed themselves at a certain distance away, growing new trees everywhere. The big tree was in the center, with small trees all around. There was also a great hall where all the animals, in pairs, were playing. But there were no humans except Father. Looking up, I found a huge flower. I asked him what flower it was. He said, "It is I." There was a blossom there. He said: "It is the symbol of the Bride." We looked around in ecstasy and joy. When I looked back to the old world, I saw that it had spider webs and dirt which I did not notice while I was there. Such experiences were very common among our members. Without these experiences, many of them would have fallen away while he was imprisoned and while we went through tribulations. When we wanted more of such experiences, Father told us: "If you are too much intoxicated in that sort of thing, you cannot work. At the time of Jesus, how many people continued to follow him after seeing miracles?" Do not be drawn by miracles. Everything happening around you is a miracle. You are directly hearing the words of God through Father. If you go like Paul, walking in the street thinking of things against God's Will and a voice thunders from Heaven to scold you, wouldn't you apologize in repentance? But God's voice is coming through His instrument. As Father talks to us in a thunderous voice, with zeal, energy, and begging, we don't listen to him attentively and don't receive the voice as coming from God through him. How to receive what is coming in reality is more important than experiences from the spirit world. You must take everything happening to you as a revelation from God every voice coming through your brothers and sisters with the sincerity of heart and love as the voice coming from God. In July, 1958, the first Korean overseas missionary in the history of the Unification Church, Mr. 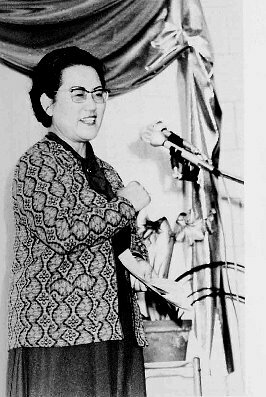 Sang Ik Choi, was sent to Japan. Mr. Kamiyama will some day tell you about our Japanese movement. Then in January of 1959, Dr. Young Oon Kim left for America and in September of the same year, Mr. David Kim left for America, too. In February, 1961, Mr. Bo Hi Pak came to America. I hope you will be able to hear their testimonies directly. Now, let me talk about our first 7-year course. The first year of the first seven-year course, 1960, was an epoch-making year in the history of the Unification Church. That year, for the first time in our history, Father gave us a new year's motto: "Let us make greater accomplishments than ever before." In 1960, Father's own blessing took place. In 1961 was the blessing of the 36 couples, in 1962 the blessing of the 72 couples and in 1963 the blessing of 120 couples. Then Father's first visit to the United States took place in 1965. At that time he visited forty countries, where he blessed 120 Holy Grounds. In 1967 he made the second trip to Japan, taking with him many staff members including the late president Mr. Eu and the present Mr. Kim, who gave lectures in the national headquarters. In 1960, the Unification Church was organized to have many departments staffed by the 36 couples. In 1963 we organized the Little Angels dancing troupe. In 1965, 1966, and 1967 they performed in America, attaining great success. In 1960 Father established Parents' Day and Children's Day. In 1963 he established the Day of All Things. In 1960 there was the first lecture giving contest, the first music contest, the first high-school association, and the first CARP. At the end of the year, the movement for unity of Christian denominations was formed. Also in 1960 we organized 40-day witnessing campaigns for the first time one in the summer and one in the winter. Those in the winter included literacy campaigns. Towards the end of that year our Divine Principle book was written and published in Korean. On April 10, Father reorganized the churches, increasing the number from 70 to 133. I know that all of you are most anxious to hear about Father's Blessing in 1960. I will tell you about that now. For Providential significance, Mother was supposed to be under the age of 20. Father was to take a blossoming virgin maid as Eve before the fall. He could have taken her when he was 20, 30, or 40. But Father had to wait so long to find a really qualified and prepared young lady of Divine choice. It happened in such a way that it seemed like a flash. Father wanted me to live with Mother before the engagement in the same house near the Church so that I could observe her closely and we could deeply touch each other heart-to-heart. Father meant for me to talk with her about the Principle, especially Father's search for a bride and what she should be like. But I didn't have to do that because she was prepared. She was such a blossoming, innocent youth. And her way of observing things was so deep that she would speak little but act out whatever she believed in. I would accompany her to Father's place to meet him. I shall never forget the first occasion when Mother met Father. She was in traditional Korean costume; she wore a yellow chogori, with a red ribbon to match her red skirt... All of a sudden Father wanted her to sing. Mother sang a folk song: "When spring comes, mountains and fields valleys and river banks are decorated by azaleas. My mind, too, is blooming like azaleas. When you come and pluck the flowers, don't leave me alone. Pluck my mind, too." It is very meaningful when I think of that now. She was not shy at that moment. She sang so nicely, so full of zeal and beauty. After that, Father took her up to his room. He asked several questions. Mother was not at all shy, articulately answering the questions one after another. And then Father wanted her to make a drawing. She drew a landscape with a figure. Father would take her out every day to the mountainside. They talked and talked, mainly about the core of the Divine Principle. Mother's understanding was so illuminated that she could answer every question asked. It was a thrilling experience. In that way Father would nurture her to bring her up to the stage when he thought that he could have the engagement ceremony. On the first of March, according to the lunar calendar, there was an engagement ceremony, with beautiful garments and colorful decorations. It was held upstairs, with some of the oldest members in attendance. And then came the wedding day. The heavenly Blessing was on the sixteenth of March, on the lunar calendar, which fell on the 11th of April of that year. The shabby old place which used to be a Japanese temple became the greatest historical place in Father's own Blessing. The paper screen doors between the rooms were all removed, giving more space. Father and Mother marched towards a decorated stage, with all the members in white robes standing on both sides. Father walked as though his path were strewn with flowers, bowing with his bride every seven steps. We were all very awe-stricken; we were both happy and sad because the place was so small for such a great event. That place will be kept as a museum all through eternity. After bowing the last bow, they exchanged vows and rings, Father and Mother then went up on the stage. Facing the audience, he announced his Blessing and said a tearful, deeply touching prayer. If he could not have located a bride in that year when he was forty, where again would he have found one? To find one to meet the qualifications was so very difficult it could have taken years. To give birth to a divine family is very important. Mother was an only child, but she is so fruitful. God blessed Father's family to have such wonderful fruition of child after child. In the first seven-year course Ye-jin was born in 1961. At that time Dr. Shin Ook Kim [Lady Dr. Kim] assisted the delivery, which took place in our Church. Ye-jin began to smile and speak very early. Instead of walking she would try to run. Hyo-jin, born in 1962, being a male, was entirely different. He was a little slow in sitting and walking. But he too had keen observation. Whatever he liked, he became completely intoxicated with. He also would give out everything that he had. Then In-jin, the second girl came in 1965. We were on our first world tour in Italy when we got a telegram informing us of her birth. She is very meticulous and artistic; her speaking is like singing. She is so considerate, both shy and active. Next came Heung-jin, the boy. He was very deep, not talkative. He thinks a lot and speaks little. In 1967 Un-jin was born. As she grew up, she was so smart, so feminine. In 1960 we had our first revival meeting. The next in 1963 was very big, lasting for four weeks. I can recall how hard we worked to fill up the small auditorium. Negative people would interrupt, sometimes even throwing stones. But our speakers would go on and on. In Taegu and other places, Divine Principle lectures were given in noted universities. In 1965 Father made his first world tour. He had our members drive day and night. We set up Holy Grounds in all fifty states in forty days using Holy Salt and soil brought from Korea. On about the 25th of July at Gettysburg Father met with former President Eisenhower. Father had a long conversation with him, talking about the foreign policy of his administration. He lent attentive ears to what Father had to say. In 1967 we visited Japan with three of the children, Hyo-jin, Ye-jin, and Heung-jin. They were so quick in picking up the language. All the members were so overwhelmed with their presence.